Episode Review: CHUCK, "Chuck vs. The Bearded Bandit"
Just when I was starting to like Morgan as a character, Chuck had to go and give us "Chuck vs. The Bearded Bandit" which was probably my least favorite Morgan-centric episode to date. Carmichael Industries was still trying to make a profit, so they took a job from the unsavory Karl Sneijder who did not dispute his background but asked them to help him save his brother, Wesley, who was kidnapped. As it turned out, Wesley was hiding from Sneijder because he was working with the government to put him away, and Sneijder planned on killing him. So instead of letting Sneijder have his brother, the team decided to protect Wesley, but they knew they were in over their heads. While coming up with a solution, Morgan started a dust up with Casey because he was frustrated with being on the sidelines even though he's the Intersect. Rather than just doing nothing, Morgan decided to go to Sneijder's office to take him out with Chuck's help, but Chuck knew they couldn't do it without Casey and Sarah so he called them. Thankfully, they showed up in the nick of time with reinforcements, but Morgan was upset by Chuck's lack of faith which caused further tension. 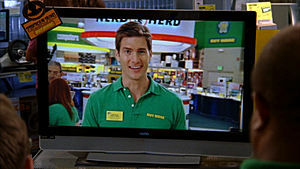 You see, Morgan's been chomping at the bit to unleash his new skills but has been suppressed by Chuck, Sarah, and Casey. The way Morgan saw it, he had the Intersect to do good, and he even tried to be a vigilante superhero, but that move backfired. Chuck on the other hand knew that Morgan was not ready to fully use the Intersect, and the rest of Carmichael Industries felt that he was not ready to be used on missions. Being kept in the van annoyed Morgan, and instead of doing what he was told, he disobeyed every order he was given which ended up making things worse. By episode's end, Morgan was so fed up with the way he was treated that he ended up defecting to rival security company named Verbanski Corp that was led by an old flame of Casey's and was trying to woo Sarah to join up. Maybe this was the effect that the writers were going for, but I could not stand Morgan by the end of "Bearded Bandit." The fact that he never listened to Chuck, constantly put himself in harm's way, and his cocky attitude did nothing but make him extremely unlikable. I'm sure we're supposed to feel partially bad for Morgan since he's obviously not being used to his fullest ability, but the way they he went about dealing with being on the outside didn't make him sympathetic...only pathetic. In spite of Morgan bringing the episode down, Chuck had some particularly good moments that picked up the slack. The idea of having him be Morgan's handler makes perfect sense which could create the right amount of tension between the two friends. Also from the looks of it, Morgan's not above bringing Sarah into the fray, but my gut says Chuck's relationship with her will be rock solid. I was also happy to see Chuck function as a spy without the Intersect. He showed that he can handle himself in a fight, and even contributed to the mission with his high tech know how. I was a little skeptical of how much Chuck would be able to hold his own sans Intersect, but "Bearded Bandit" showed me that he'll be fine. In a minor Buy More B-plot, it seemed that the big box store was also having a problem with finding customers. Big Mike was back from his month-long honeymoon just in time to save the day. Unfortunately his idea was to show an old commercial from the 70's. He decided to update the promo, but none of the Buy Morons had the look that could excite both the ladies and the men. Enter Captain Awesome. Mike was able to convince Devon to be the new face of the Buy More because it would save the company and it turn his brother-in-law. I've gone on record by saying that I'm usually not a huge fan of the Buy More as a plot device. More often than not, it doesn't add too much to the overall story, and it usually only there for comic relief. The thing is, most of the time I find the humor involved with the Buy More a bit cartoonish and unfunny. This time around I found myself enjoying the Buy More scenes mostly because I love me some Captain Awesome. Casey spitting after saying Soviet Union was classic. Stupid NBC. Pushing back the air date meant that all of the Halloween decorations made no sense! I kid. Sneijder's right. I don't think I've ever eaten a bran muffin before. Was I the only one disappointed that Casey wasn't wearing a certain knit cap when he was on his stake out? I liked Sarah's Ethan Hunt impression. Do Abercrombie & Fitch models even wear cargo pants? Or any clothes for that matter? "It made a nasty scar over one of my favorite scars." "What? Is that an actual tumbleweed?" Big Mike: "Man, I am so over this whole Jeffster thing." "That is a pretty man." "Chuck vs. The Bearded Bandit" would have been a better episode if it didn't have the Bearded Bandit. Morgan's regression as a character was distracting, and it didn't make me believe him as the Intersect. Honestly, all it did was to have things back to normal. Complaints about Morgan aside, I do have to admit that there was some promising story elements introduced during "Bearded Bandit". We'll just have to see if the writers can capitalize of them. << Next Episode: "Chuck vs. The Frosted Tips"
@Anonymous - Morgan was acting like a jerk before the Intersect started to mess with his head. If you watch closely, he got hit on the head during the fight at Sneijder's. To me, that was when the Intersect started acting up. Now, I might be wrong about that interpretation, but the fact that they highlighted the blow to the head makes me think that was the cause. Now, I'll agree that things will get interesting from here, and this episode will probably mean more to the longer story arc. It just made me like Morgan even less than I already did. Well Morgan wasn't that bad before he got hit in the head (wanting to save the store clerk wasn't THAT much of a jerk move). Part of it is also Chuck being inexperienced as a handler, being his friend and also that Morgan has been on missions before if we are comparing Morgan to when Chuck intially got the Intersect (Sarah and Casey were unknown professional agents who were a lot stricter on Chuck). But I do see your point =) I think it's intentional since a lot of the new season is trying to show how Chuck wasn't just the intersect (in how he didn't let it get to his head as much). Should be interesting to see where this ends up. Thanks for reading. I did think about recapping Castle again, but Mondays are packed and I record my podcast then, so not enough time, but I'll keep it in mind.